Top track records! details oriented! ABC believes that people should be employed on the basis of the ability to do the job, rather than on the basis of personal characteristics or beliefs. The corporation actively seeks, promotes, and manages diversity within the workforce. In managing strategic diversity, ABC embraces a philosophy of encouraging all ABC employees to feel comfortable with being themselves while working together toward shared business goals. ABC furthers this principle on a global basis through on-going training, development, and education programs designed to create a positive environment in which each individual is empowered to reach his/her fullest potential. Experience Years of translation experience: 22. Registered at ProZ.com: Mar 2001. 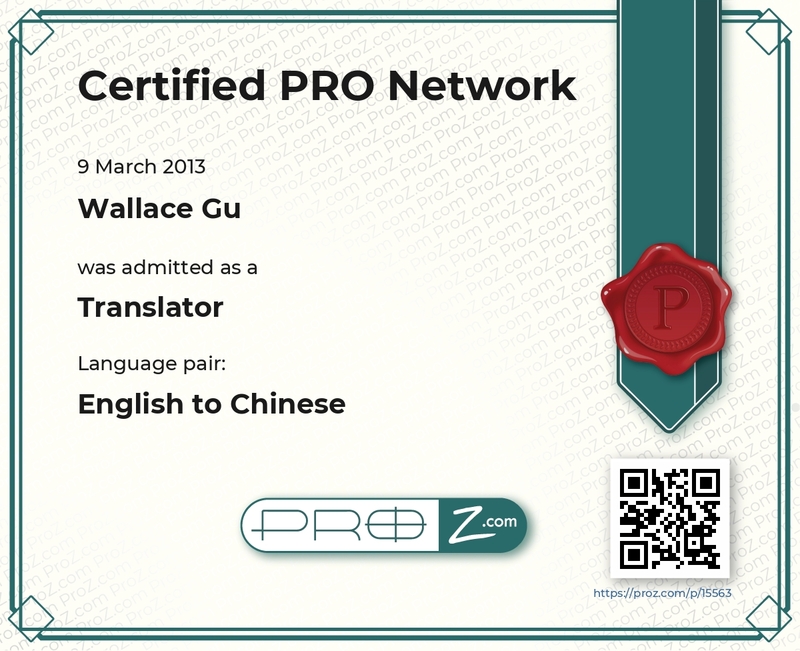 Professional practices Wallace Gu endorses ProZ.com's Professional Guidelines. It's NOT just about "languages conversion", but rather an art and passion in cultural nuance. Over 14 YEARS extensive experience in this demanding translation industry. MASTERLY in translating and editing both technical and general text. Director of the Translation Service Department, Chengdu Translator's Association. Leading a small robust team to offer strong support for your EN<>CN translation needs. Quality oriented, with focus on details. Beat any deadline! Leading a SLV team: Since 2003, I began to lead other professional Chinese translators to offer stronger support to our clients. We provide translation and localization services in only one language combination: English<>Chinese, and truly excel in this particular pair compared with other China-based MLVs. Western Digital, 3COM etc. (2000-Present). (An Accountant License and an Accounting Practitioner Qualification Certificate issued by provincial Labor Administration). Western Digital -- One of the world's top-brand hard disk manufacturer. Translation of its products documentations. Infosys -- One of India's biggest IT giants. Localization of its entire group website into Chinese. Translation of its monthly financial reports. China Netcom (CNC) -- China's top telecom operator. Translation of its IPO documents. Deloitte -- Translation of its entire HR niche website into Chinese. INSEAD -- World's first class international business school. Translation of its brochures and press release. WSPA -- London based animal protection organization. Consulting/researching project. EATON -- Translation of its engineering specifications & purchase contracts. Bayer -- Chemical patents, blood sugar testing equipment (Ascensia® CONTOUR™ SYSTEM) manuals. BloomBerg -- Translation of its service contract templates. China Pacific Insurance Co.,Ltd -- (It’s the biggest state-run insurance company in China) Translation of the OPINION ON THE CALCULATION OF VALUATION RESERVES OF THE LIFE INSURANCE BUSINESS, and the ACTUARIAL APPRAISAL OF THE ECONONIC VALUE OF THE LIFE INSURANCE BUSINESS. Hong Kong Science & Technology Park -- (HKSTP, a major industrial project sponsored by HK government) Translation of its official website content. Singapore Changi International Airport -- (1) Translation of the operational guidelines of its firefighting team. (2) Translation of documents of its logistic department. Mild Seven -- Translation of the official website of Mild Seven Outdoor Quest. Bills Committee of Legislative Council of Hong Kong -- Translation of the Chinese Medicine Bill. Tourism Tasmania -- Translating its brochures and website contents into Simplified Chinese. Club Dice Casino -- (A famous online gaming company.) Translation of its online help text. War Dog -- It's a movie, and I did the subtitling into Chinese. * TOP QUALITY GUARANTEED - Tens of millions of words and over 3,000 of projects handled. * INTENSIVELY EXPERIENCED - fully dedicated in this demanding industry for OVER 14 YEARS. * TIMELY DELIVERY & marvelous client-support. Beat any tight deadlines! 3,000 words daily output. Capacity is scalable. * HIGH AVAILABILITY (14 HOURS/day) - Full-time professional translators. * EXCELLENT RESPONSIVENESS, answering your emails within a few minutes. * ONLINE REAL-TIME COMMUNICATION - using instant message tools including MSN and SKYPE, with mobile SMS support. * BROADBAND CONNECTION - high speed Internet access. Can receive and send big files. * COMPUTERS, PRINTER, SCANNER & FAX equipped. * TEAMED UP with a group of professional translators and technical specialists. * TECHNICALLY CAPABLE - equipped with SDL Trados Studio 2011, Photoshop, FrameMaker 7.1, PageMaker, Acrobat Standard 6.0, Illustrator, InDesign, InterLeaf etc. Currently I serve as the Director of the Translation Service Department of Chengdu Translators' Association. This is a local professional organization for translators and interpretors active in governmental and public translation service market in Chengdu and in the greater Sichuan Province. Leveraging over 14 years extensive hands-on experience in this demanding translation industry, I am now running a SLV (Single Language Vendor) company staffed by a small group of veteran translators and technical specialists (focusing only on this unique language pair of English<>Chinese translation) to offer stronger support to our clients. As a highly focused professional Chinese translation team, we wish to be your choice vendor for all your EN<>CN services. Doing business over Internet is associated with certain risks. When you assign a project to a freelance translator living in a country thousand miles & several time-zones away, you are kind of "betting" on whether he/she will and is able to finally return a up-to-standard job by due deadline as he/she agreed. Your only chance to win is to pick those who have outstanding qualifications and demonstrated professionalism. Translation is my FULL-TIME PROFESSION, and I treat it seriously as a TRUE BUSINESS with passion - that's how I established happy long-term cooperation with many demanding clients. "I send important stuff back to you as you are so efficient and good :) and we never get complaints only praise for your work." "Assigning our Chinese projects to Wallace really gives us the peace of mind! Experts!" "Many thanks as always. You're a star." "Nowadays it's not easy to find such a dependable translators doing as great as you are! " (I wrote: "You know, I claimed marvelous client support..."). Client wrote: "AND MARVELOUS IT IS!" "Excellent translation! Working with you makes my life easier, Wallace!" "You guys really know the stuff and delivered a quality job! True professionals! Please also extend my thanks to your partners!" "Good news! According to client's feedback, the quality is superb! They liked it, and will surely send over more batches! We're going to keep you busy for this month! Be ready for it. :)"
"Yes, quality & details-oriented! You are setting a standard for all fellow translators." "That's what we call the PROFESSIONAL approaches! Keep up with your good work!" "My editor seems to have some difficulty - though the file is big, she was unable to identify "enough issues" to make amendments - this means you guys had really done a great translation job there! THANKS!" Keywords: ENGLISH TO CHINESE TRANSLATOR, CHINESE ENGLISH TRANSLATOR, ENGLISH TO CHINESE TRANSLATION, CHINESE TO ENGLISH TRANSLATOR, CHINESE TO ENGLISH TRANSLATION, TRANSLATE FROM ENGLISH TO CHINESE, ENGLISH CHINESE TRANSLATIONS, TRANSLATE CHINESE INTO ENGLISH, TRANSLATE DOCUMENTS FROM CHINESE TO ENGLISH, TRANSLATE DOCUMENTS FROM ENGLISH TO CHINESE, TRANSLATE ENGLISH TO CHINESE SYMBOLS, CHINESE CHARACTER TRANSLATION, COPYWRITING, COPYRIGHT TRANSLATION FROM CHINESE, CHINESE ENGLISH TRANSLATION, SITES TO TRANSLATE ENGLISH TO CHINESE, TRANSLATE ENGLISH NAME TO CHINESE, TRANSLATE ENGLISH WORDS INTO CHINESE SYMBOLS, CHINESE CHARACTERS TRANSLATE ENGLISH, CHINESE WORD TRANSLATE IN ENGLISH, TRANSLATE CHINESE FROM ENGLISH, DOCUMENT TRANSLATION SOFTWARE, TRANSLATOR FROM CHINESE TO ENGLISH, SIMPLIFIED CHINESE, TRADITIONAL CHINESE, CANTONESE, MANDARIN, CHINESE SIMPLIFIED, CHINESE TRADITIONAL, ENGLISH TO CHINESE TRANSLATOR, CHINESE TRANSLATOR WANTED, CHINESE ENGLISH TRANSLATOR, TRANSLATE CHINESE DOCUMENT, TRANSLATION OF ENGLISH WORDS TO CHINESE WORDS, TRANSLATE MANDARIN TO ENGLISH, TRANSLATE ENGLISH TO MANDARIN, MANDARIN ENGLISH TRANSLATION. SDL Studio 2011. CHINESE TRANSLATION QUOTATION, COMPETITIVE PRICE, NATIVE CHINESE TRANSLATOR, CHINESE TRANSLATION TEAM, CHINESE TECHNICAL TRANSLATOR. SPECIALTY: TOURISM, BUSINESS, MARKETING, IT, SOFTWARE, HANDWARE, NETWORK, CHEMICAL, PATENT, MEDICAL, MECHANICAL, AUTOMOBILE, HOME APPLIANCE, PRESS RELEASE, GAMES, TECHNICAL. Chinese translation, Mandarine, Asian market, ACE CHINESE TRANSLATION, doing business in China, Chinese talents, Traditional Chinese, Simplified Chinese, Chinese Big5, Chinese GB, China, Pu Tong Hua, Cantonese, Chinese market, Asian languages. Trados Studio 2011, Passolo, Alchemy Catalyst, Wordfast, SDLX. Keywords: 中译英、英译中、中文译员、中国翻译员、普通话、粤语、简体中文、繁体中文，CHINESE ENGLISH TRANSLATOR, ENGLISH TO CHINESE TRANSLATOR, CHINESE TO ENGLISH TRANSLATOR, ENGLISH TO CHINESE TRANSLATION, CHINESE TO ENGLISH TRANSLATION, TRANSLATE FROM ENGLISH TO CHINESE, ENGLISH CHINESE TRANSLATIONS, CHINESE ENGLISH TRANSLATION, TRANSLATOR FROM CHINESE TO ENGLISH, SIMPLIFIED CHINESE, TRADITIONAL CHINESE, CANTONESE, MANDARIN, CHINESE SIMPLIFIED, CHINESE TRADITIONAL, ENGLISH TO CHINESE TRANSLATOR, CHINESE TRANSLATOR WANTED, CHINESE ENGLISH TRANSLATOR, TRANSLATE CHINESE DOCUMENT, SITES TO TRANSLATE ENGLISH TO CHINESE, TRANSLATE ENGLISH NAME TO CHINESE, TRANSLATE ENGLISH WORDS INTO CHINESE SYMBOLS, CHINESE CHARACTERS TRANSLATE ENGLISH, CHINESE WORD TRANSLATE IN ENGLISH, TRANSLATE CHINESE FROM ENGLISH, TRANSLATE CHINESE INTO ENGLISH, TRANSLATE DOCUMENTS FROM CHINESE TO ENGLISH, TRANSLATE DOCUMENTS FROM ENGLISH TO CHINESE, TRANSLATE ENGLISH TO CHINESE SYMBOLS, CHINESE CHARACTER TRANSLATION, COPYRIGHT TRANSLATION FROM CHINESE, DOCUMENT TRANSLATION SOFTWARE, TRANSLATION OF ENGLISH WORDS TO CHINESE WORDS, TRANSLATE MANDARIN TO ENGLISH, TRANSLATE ENGLISH TO MANDARIN, MANDARIN ENGLISH TRANSLATION. SDL Studio 2011. CHINESE TRANSLATION QUOTATION, COMPETITIVE PRICE, NATIVE CHINESE TRANSLATOR, CHINESE TRANSLATION TEAM, CHINESE TECHNICAL TRANSLATOR. SPECIALTY: TOURISM, BUSINESS, MARKETING, IT, SOFTWARE, HANDWARE, NETWORK, CHEMICAL, PATENT, MEDICAL, MECHANICAL, AUTOMOBILE, HOME APPLIANCE, PRESS RELEASE, GAMES, TECHNICAL. Chinese translation, Mandarine, Simplified Chinese, Traditional Chinese, Chinese Big5, Chinese GB, China, Pu Tong Hua, Cantonese, Asian market, Chinese-English translation, doing business in China, Chinese talents, Chinese market, Asian languages. Trados Studio 2011, Passolo, Alchemy Catalyst, Wordfast, SDLX.